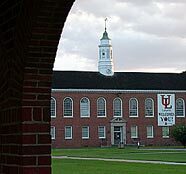 University College is making it easy for non-traditional students to start or continue their education at UL Lafayette by offering courses on Saturday mornings. For busy adults, University College simplifies the admissions process and offers classes at convenient times and locations. All Saturday courses are offered on campus and are college-level courses taught by university faculty. Fall 2005 semester courses being offered on Saturday include: CMCN 200 - Principles of Human Communication; CJUS 399 - Criminal Aspects of Louisiana Environmental Law; FNAN 300 - Business Finance; and PHIL 234 - Introduction to the Old Testament. All classes are from 9 to 11:50 a.m. in H.L. Griffin Hall. Learn something new by registering today for the Fall 2005 semester which begins Aug. 22. Register now by calling (337) 482-6729. Staff members will help with enrollment.